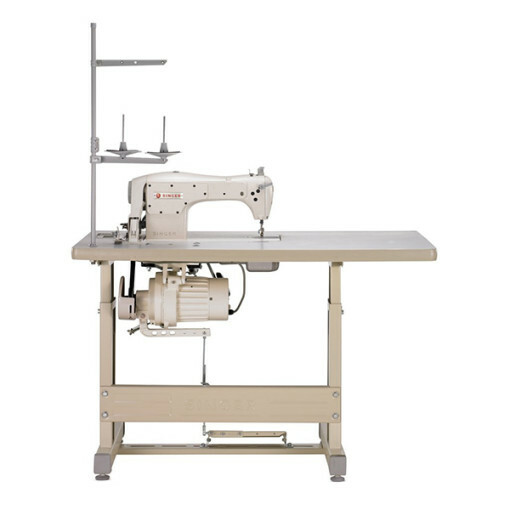 The 191D-30 is the perfect machine for tailors, seamstresses, home decorators, fashion designers, dry cleaners, and industrial sewers. Its ease of use, extra-high sewing speed and straight stitch function make it a great option for high volume domestic sewers as well. – Configuration may include sewing machine head, motor, and completely assembled single-pedal stand. 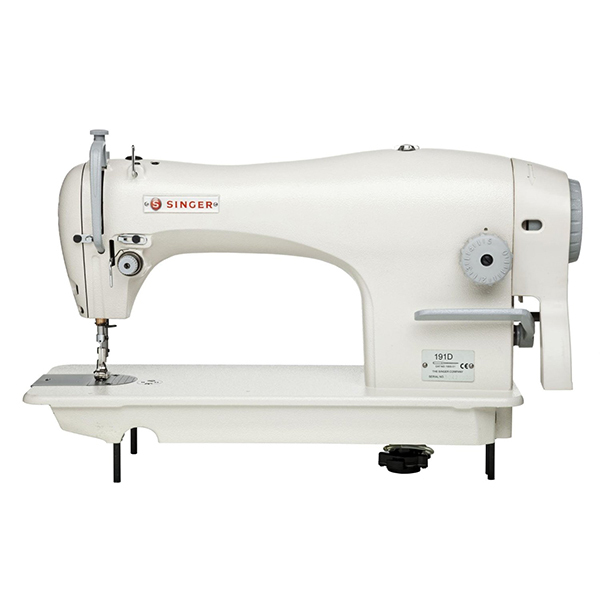 – Extra-high sewing speed sews almost six times faster than a conventional domestic sewing machine allowing you to complete projects quickly. 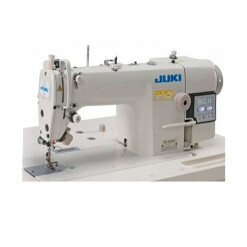 – The heavy-duty motor allows you to sew multiple layers of fabric easily. – Attached knee lifter allows for hands-free raising and lowering of the presser foot. Versatile design appeals to a range of straight-stitch sewing applications. The 191D-30 may delivered completely assembled. This complete setup is assembled in the Singer industrial assembly center in LaVergne. This complete set up includes the Singer 191D-30 machine head, stand and motor. Completely assembled including head, stand, and motor. 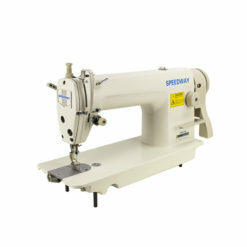 The extra-high sewing speed provides professional sewing capabilities. Sewing at 4,000 stitches per minute allows this machine to complete your projects almost six times faster than a conventional sewing machine. The machine’s industrial grade motor provides high speeds and extra power. This motor delivers up to ½ horsepower and is constructed for decades of extended use. 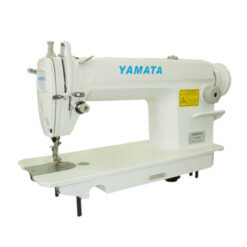 The motor is designed for high speed sewing on multiple layers of various fabric weights. Features a powerful, high speed motor designed for decades of use. 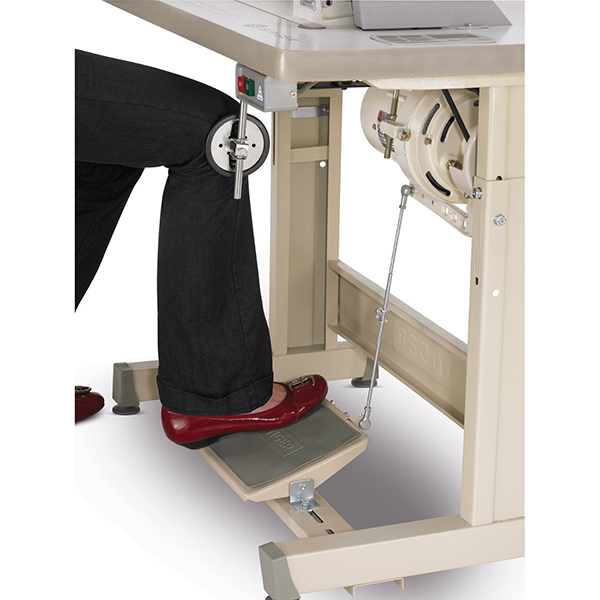 The knee lifter allows for hands-free raising and lowering of the presser foot and is vital for sewing multiple layers of thick fabric. The extra-high knee lifter provides 13.0 mm (0.50 inch) of lift, allowing for more layers of fabric to be sewn than on conventional sewing machines. If the knee lifter is not used, the traditional presser foot lifter allows for 5.5 mm (0.22 inches) of lift. This straightforward machine includes the most essential stitch — the straight stitch. Choose from various lengths with a maximum of 5.0mm (0.20 inches) for straight stitch customization. 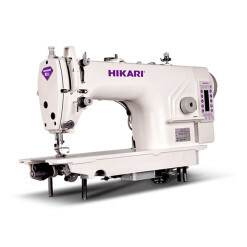 Features high speed professional stitching up to 4000 stitches a minute. The machine motor sits in an oil reservoir and self-lubricates while the machine is in use. Oil is circulated by a centrifugal pump from the oil reservoir in the machine base. This allows for efficient high-speed sewing. Self-lubricates while the machine is in use allowing for efficient high-speed sewing. The reverse lever is used to reinforce the end of seams, ensure quality stitches, avoid unraveling and provide stronger stitching. The table top bobbin winder allows you to wind bobbins while sewing. This feature allows you to always have a second bobbin ready to load for efficient use of your time. 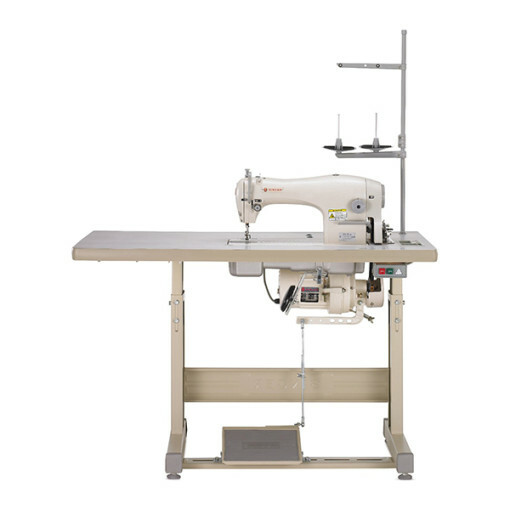 The large sewing space allows you to easily manage bulky projects. The arm of the machine extends to 11.75”, so overcrowding is not an issue. The tabletop measures 50” in length by 22.5” in width. 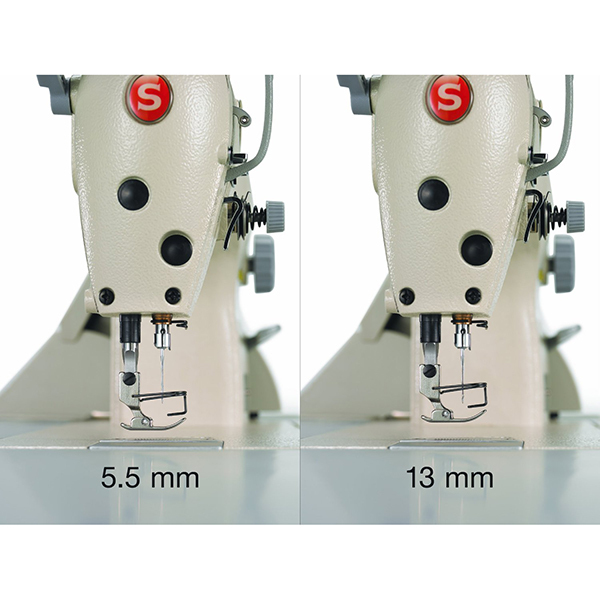 Keep your seams strong and prevent bunching on any type of fabric with adjustable stitch length. The stitch length dial can be set to a maximum of 5.0mm (0.20 inches). The amount of pressure exerted on the fabric by the presser foot against the feed dogs is adjustable. Sew from the lightest tricots to the heaviest denim with only the turn of the dial. 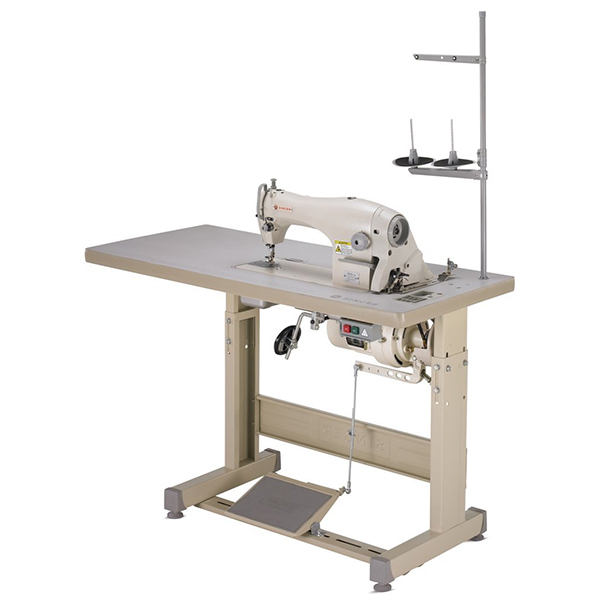 The stand’s H legs provide a safe, stable and immobile sewing space when sewing at high speeds. The stand also features adjustable height and a tan laminate top for durability. 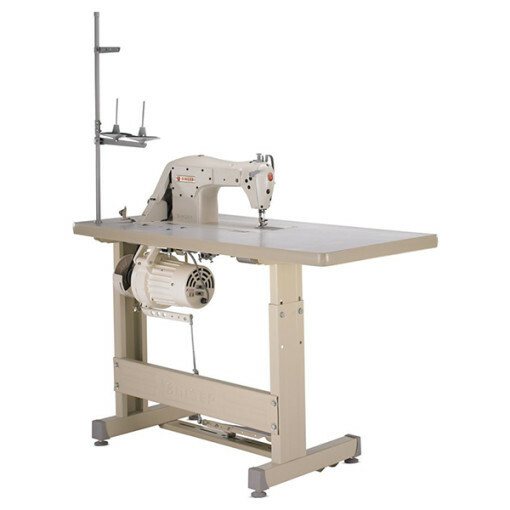 This industrial sewing machine will arrive on a wooden crate. It will then be your responsibility to transport it to its final location. The complete set-up weighs 211 pounds and will require heavy lifting by multiple people. Machines includes a container of Singer industrial grade oil that must be fully emptied into the machine’s oil pan before using the equipment; failure to do so or running the machine without oil can cause damage to the internal working parts.